Columbia Forest Products offers FirstStep®, pre-primed, ready-to-use hardwood plywood panels. This labor-saving product eliminates one to two steps in the finishing process (sealing and priming), thereby increasing your productivity and efficiency. The panels are coated with low VOC primer that will help attain and maintain adhesion of paint to the substrate. Your finished product will have a better final appearance because any substrate defects will be masked, providing a smooth and uniform finish coat. Just sand for smoothness, then paint! What items are available for priming (cores, veneers, thicknesses, sizes)? All of Columbia’s wood products offering are available for priming, limited to a maximum size 4′ x 8′ panel and 1-1/4″ thickness. Will Columbia prime Custom Birch, Chinese, or other imports? Yes. All primed import products will be Mill Run. What is the chemical makeup of the primer? It is a cross-linked water-based primer. What type of coating is best to use with the FirstStep® panel? Water-based and solvent-based coatings are compatible with FirstStep®. However, customers should contact their current coatings supplier prior to use to determine compatibility of this product. We can also make samples of FirstStep® available for testing your finish before ordering actual product. Should FirstStep® panels be sanded prior to the application of a topcoat? Yes. FirstStep® panels should be lightly sanded with 320 grit or finer sandpaper to remove fiber pop, grit and roughness. Customers should not sand too aggressively as they may sand through the primer and expose the raw wood. Customers should contact their current coatings supplier prior to use to determine compatibility of this product. Will there be shop allowable? What percentage will we allow? Will shop be separated? Yes, there will be shop. Domestic products will allow up to 20% shop, and it will be separated. All import products will be Mill Run, and shop will not be separated. What colorations of FirstStep® are available? 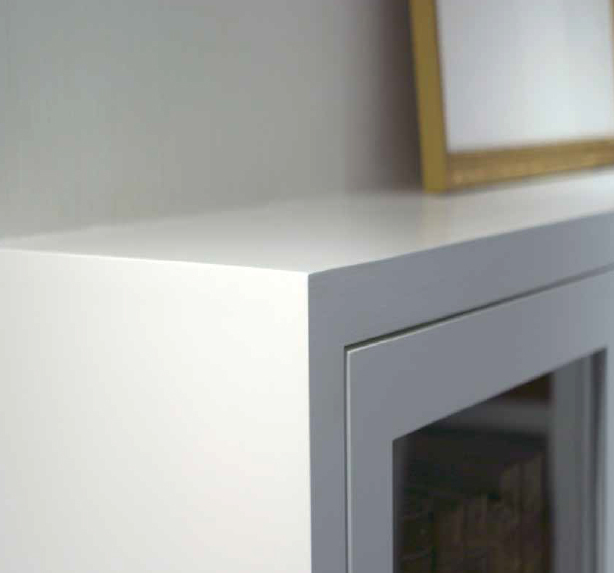 FirstStep® primed panels are available in both beige and white colorations to complement any primer job. Are FirstStep® panels available formaldehdye-free? Yes, FirstStep® primed panels are available with any core, including veneer-core produced with PureBond® Formaldehyde-Free Technology. Reduction in labor time. Eliminates one to two steps in the finishing process, increases productivity and efficiency. Reduced emissions. Lower VOC and HAPS emissions; an environmentally responsible product. Better finished product appearance. Helps attain and maintain adhesion of paint to substrate; masks defects in the substrate, allowing the finish coat to be even and uniform. Minimum grain raise for a smoother final product. Columbia quality control. Consistent quality; a trusted product from trusted source. Regional finishing facility. Consistent availability, prompt delivery.